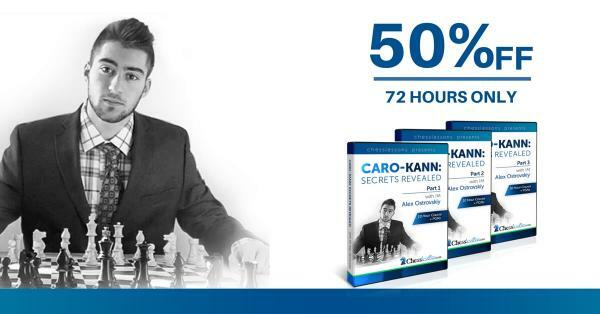 CARO-KANN THE SECRETS REVEALED by IM Alex Ostrovskiy [50% OFF until the 30th of December 2017] | Free chess downloads and training sites. Study material and suggestions. Online shopping. we are very excited to bring you the brand-new 10-hour Comprehensive Course on The Caro-Kann Defense with IM Ostrovskiy. The course provides you with a complete, master-level repertoire against 1.e4. After studying this course, Caro-Kann will become your #1 opening choice аs black and you will have a solid, well-prepared repertoire giving your opponents a lot of trouble. IM Ostrovskiy reveals all his opening preparation secrets, and shares surprise variations – absolutely nothing is being held back! The Caro-Kann is a “low-theory” opening, compared to other popular lines. Caro will totally change your game and deliver extraordinary results, without spending months working on your opening! IM Alex Ostrovskiy has 9 years of experience playing the Caro-Kann. After switching the opening preparation to Caro-Kann his rating quickly went up from 2100 to 2500!​​​​​​​ You can follow his success! A complete, master-level Caro-based repertoire vs. 1.e4 sufficient to beat opponents from 1200 up to 2400! This course provides you with the most effective and powerful opening repertoire that will help you winning many games against players of any level. And because you are our VIP subscriber you can get this brand-new 10-hour course half off! Depending on the package you pick, you can also get up to 2 FREE Bonus courses!